You've probably got "Murda on the beat so it's not nice" stuck in your head, a phrase associated with Drake dropping bars on 2017 track "No Long Talk", or the surprising chart hit "Portland" from More Life, the second most successful hip-hop record of last year. 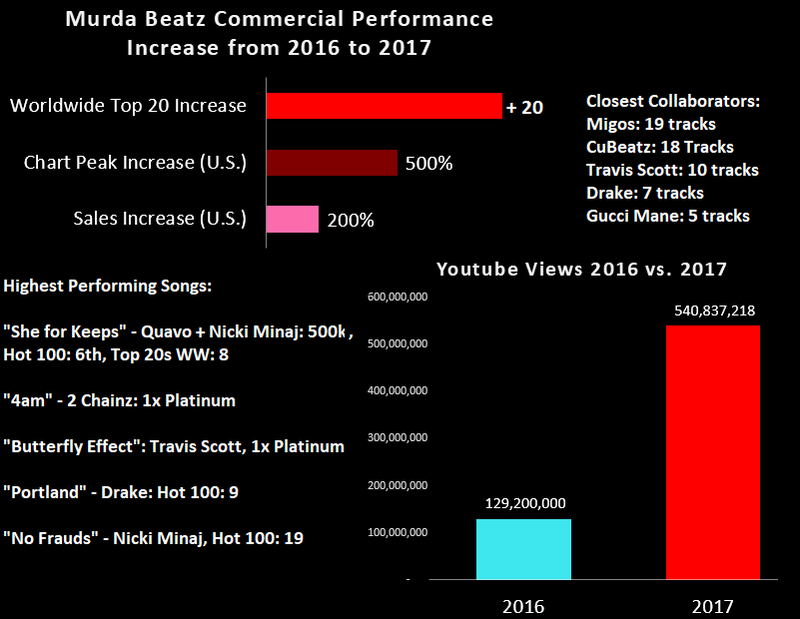 Murda Beatz's reach was much wider than this. In the last 12 months, he's established himself at the forefront of trap production through work with Migos, 2 Chainz and Travis Scott. He was one of the busiest producers of the year, picking up a production credit in 45 major songs, and notching up 3 million U.S. single sales. Murda Beatz became an essential name in rap production in a very short period of time, largely thanks to Migos. His earliest forays into mainstream production came from the trio, and Migos' stunning worldwide success has helped Murda Beatz to diversify his contatct list, adding Travis Scott, Drake, Gucci Mane, and plenty more. When his producer tag "Murder on the beat so it's not nice" was heard before on Drake's viral 2017 track "Portland", it shined a bright light onMurda Beatz's work, and all thanks to a flute! His music isn't always identifiable or easily pigeon-holed, which can be preferable. Often, he allows the production to slide to the back while the artist paints the canvas with their personality. This was highly effective on Nicki Minaj's "No Frauds" and 2 Chainz's "4am". He's not a one-dimensional producer though, on Travis Scott's "Butterfly" he crafted a beat that could hold its own without any vocals, allowing Travis to skate on the beat as he saw fit, leaving gaps that never hurt the energy or vibe of the track. His 2017 performance increase was enough to place Murda Beatz in the top 10 hip-hop producers of the year. 2018 is looking even bigger, with huge projects from Travis, Nicki, Drake, and of course, Migos. Will he top 2017? Could he even challenge Metro Boomin for the tag of Best Rap Producer? Three years ago, CuBeatz were producing almost exclusively for artists outside the U.S., with a focus on German hip-hop. The duo landed in the States with "R.I.C.O." by Meek Mill and Drake in 2015, ironically a track that could have ended the careers of both those rappers via the beef that the song sparked. It wasn't really until 2016 and 2017 that CuBeatz became a commercial force. 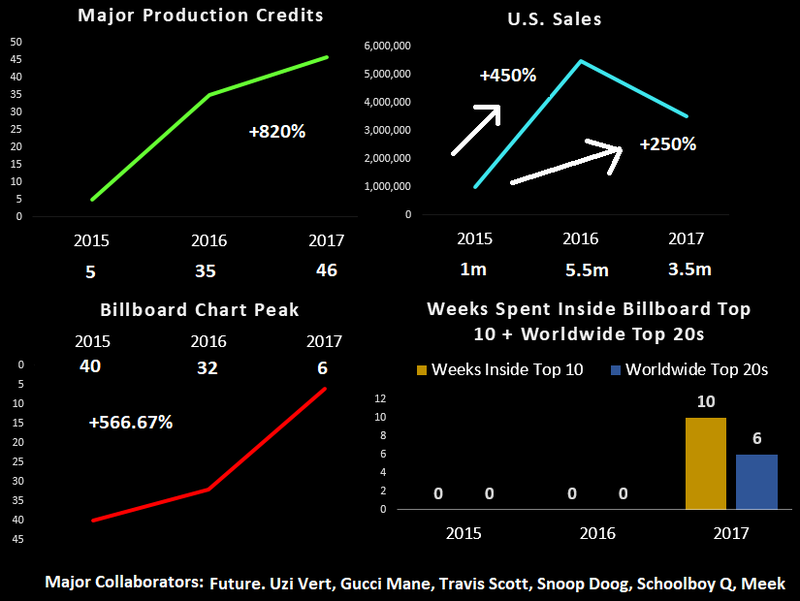 Thanks to fruitful collaborative relationships with Drake, Nicki Minaj, Travis Scott and Migos, CuBeatz became part of the "best producer in rap" conversation. Their work on "Motorsport" and "Portland" put numbers up, but they also contributed multiple album tracks to Birds In The Trap, More Life, Without Warning, Huncho Jack, Jack Huncho, and multiple Gucci Mane records. They are also proud owners of two Kanye West credits, through Ye's features on "THat Part" by Schoolboy Q and "Ballin'" by Juicy J. 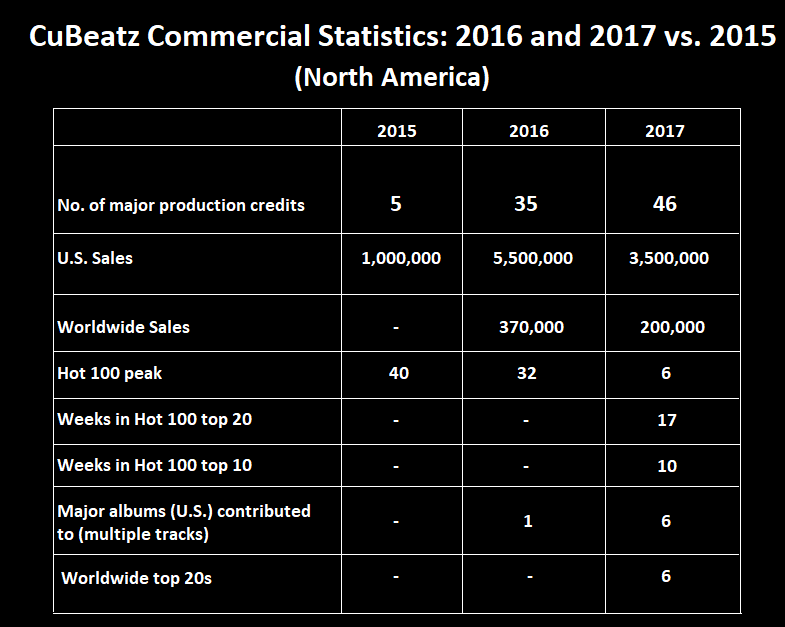 9 million single sales in the past 2 years, and 81 major production credits suggest CuBeatz have transitioned emphatically from German hip-hop to the U.S. market, in which rap is now the most popular genre. Their work pre-2015 favoured hard-hitting, crisp drums, not dissimilar to the boom-bap explosion in New York in the 90s. Tracks for Loexesh, Kurdo and Animus were certified slappers, but in 2015, through G-Eazy's "Oh Well" and the intro to Joell Ortiz's project, they began to start filtering those drums and the rest of the instrumentals to create a slight feel of being underwater, a hint of the chopped and screwed phenomenon that Drake and 40 helped translate into mainstream success. Artists began coming to CuBeatz for a beat that sounded contemporary and new, but still hit hard and allowed them to spit bars. Nowhere is this more obvious than "No Shopping" by French Montana and Drake, a track that sounds like a standard trap beat until those drums drop harder than anything else on the radio. The beat change on Drake's "Summer Sixteen" also added a gritty edge to Drake's nasally rapping that lent cred and weight to his words. There are multiple projects on the horizon from artists the duo has previously worked with. Travis Scott is "on a mission to be heard" in 2018, Kanye West is in the mountains crafting his next culture-shifting record, Drake promised he'd be back in 2018 to tell his story, Gucci Mane will doubtless be dropping several projects, and Nicki Minaj's highly anticipated 4th LP is almost certain to drop. CuBeatz might have broken through in 2017, but they might dominate 2018.